Orange bill, wings spread out. Run! I hope you will enjoy the 12 Days of Christmas haiku; there will be published one each day starting on Christmas Day. Subscribe to my newsletter to never miss a blog post. In a previous version of this song the geese were ducks a-laying. The geese has always been considered a symbol of the solar year (due to their annual migration) and of fertility. You can enjoy more haiku on this page of my website. 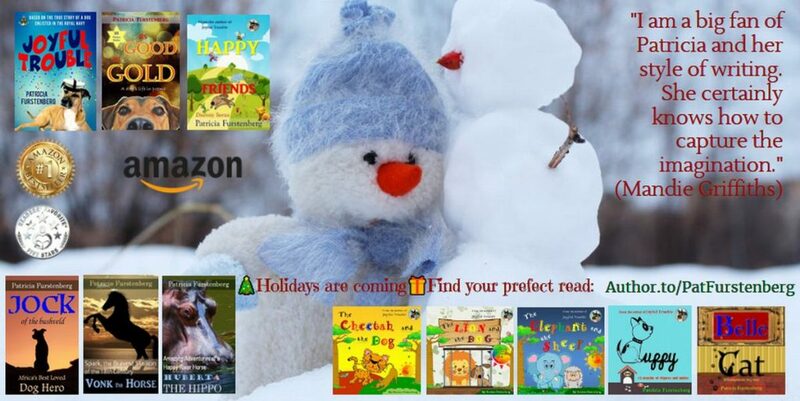 Find all my book on Amazon. Enjoy! I chose the name Haiku-San as it derives from Haiku, meaning unusual verse in Japanese (hai=unusual, ku=verse, strophe) and San, the honorific Japanese title when speaking about people. San is also the phonetic transcription of the first syllable of the English word Sunday, Sun-day hence Haiku-San, a Sunday feature on Alluring Creations involving Haiku I write. 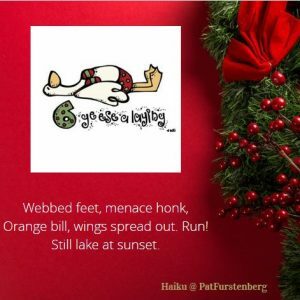 Text and Haiku-San © Patricia Furstenberg. I hope you enjoyed my haiku. Let me know your thoughts in comment below.